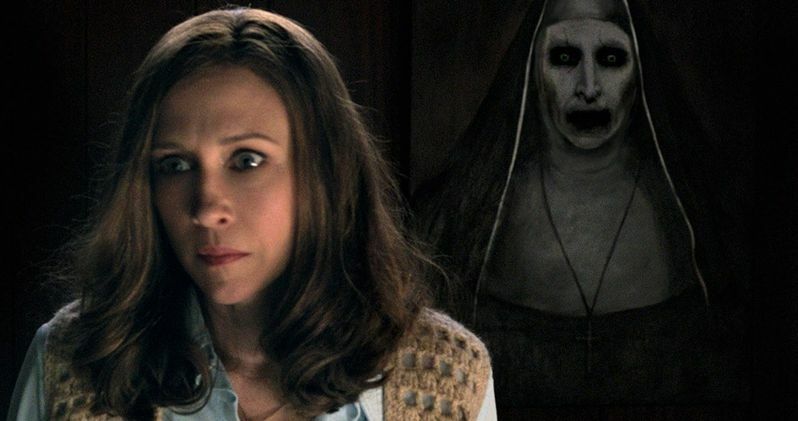 While some are starting to call this current summer season one of the worst in recent memory, Warner Bros. did manage to squeeze out a hit this weekend with their horror sequel The Conjuring 2. It has earned $40.4 million domestically and another $51.5 million overseas for a worldwide box office take of $91.9 million off a $40 million budget. The film was helped along at the box office by some big scares. But the movie's best moment didn't happen until reshoots. And there is a good reason for that. Being a horror sequel, director James Wan didn't want to simply regurgitate the first movie. He goes big, not only exploring the iconic Enfield haunting but also tapping into the infamous Amityville case and the profound effect it had on real-life supernatural demon hunters Ed and Lorraine Warren. While the movie has been garnering some great word of mouth and very good reviews, some are left with one big lingering question. This 'plot hole' deals with The Conjuring 2's central villain. If you haven't seen the movie yet, there will be some spoilers. io9 managed to get director James Wan to open up about the central villain, and he revealed that the demon wasn't part of the initial production process. And it's because he didn't know what it would look like, or how he would approach it, and wanted to save it for a later date. About the way this monster was worked into the movie, he explains this. "I had a strong outlook on the whole movie, but the one thing I wasn't quite sure of [was the design of the demon character]. I felt like I was still discovering it. And believe it or not, I always knew that I was going to do additional photography. So I was saving it because I was hoping I'd discover what that thing would look like as I was putting the movie together in post-production. And that terrifying vision is a nun that Lorraine Warren, played by Vera Farmiga, sees early on in the film. The spooky spectre is first seen during the Amityville scenes. Warren later sees the same apparition at her home. And then, the big climax of the film reveals that the Nun is actually the one haunting Enfield, not the old man the film has set up as the villain. It's a big twist, which finds the Nun using the old man's spirit to infiltrate and haunt an unsuspecting family. Some have wondered how this actually works, though. How did Lorraine see the Enfield apperaition both at Amityville and at home, thousands of miles away from the UK, where the main story takes place? Some don't think it makes any sense. But Wan has an answer. "Believe me, I was wondering if anyone was going to ask me that. So far I've managed to get away scott-free. But I will kind of explain my reasoning behind that. When she's at Amityville? It's not like she's haunted by a ghost at Amityville, she's having a premonition of what's going to happen to her husband in the near-future. That's all it is. So she's seeing what's going to happen at the end of the movie. The demonic entity that takes on the form of a nun has got nothing to do with Amityville. At all. She's just having a psychic premonition." This means that when Lorraine Warren saw the Nun at her home, it was just foreshadowing for what was about to happen in England. Wan goes onto detail how he came up with the look for the Nun. When he first heard about the apparition from the real Lorraine Warren, it sounded like it would be a CGI character. But he didn't want to do that. "From talking to [the real] Lorraine in passing, she mentioned a spectral entity that has haunted her in her house. And it's this swirling tornado vortex with this hooded figure in there, and I remember hearing that and my first thought was, 'Oh crap, that's going to be a CGI character.' I didn't want to do that. And so, it kind of took me awhile to cement in my head what this vision was. And it came across eventually in a very organic way. Because it is a demonic vision that haunts her, that only attacks her, I wanted something that would attack her faith. Something that would threaten the safety of her husband. And so that was eventually how the idea of this very iconographic image of a holy icon cemented in my head. I think it speaks to the filmmaking process. That it's such a discovery process. Sometimes you see things, sometimes they're discovered along the way." Hopefully that explains more about the big twist and how it all came to be in the Conjuring 2. The sequel is such a hit, it almost demands a sequel. But we're not sure if James Wan will be back to finish off the trilogy he started. The title already has one spinoff under its belt with the thriller Annabelle, which focuses on the infamous demonic doll. Early talk on the sequel is that The Conjuring 3 could revolve around werewolves. But James Wan is going to have to get through Aquaman first, so there is no telling when we may see the next follow-up. We might get Annabelle 2 in the meantime, though.